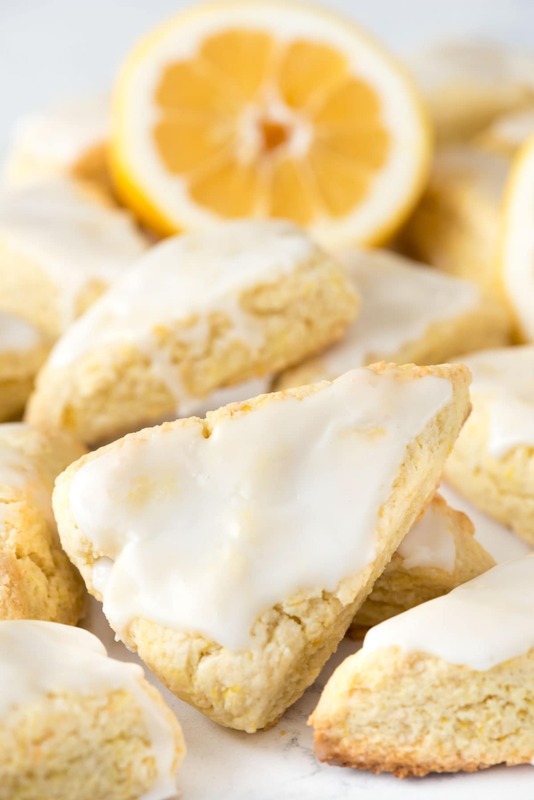 These Mini Lemon Scones have TWO secret ingredients, both of which will blow your mind. Last weekend I went away with a few of my local mom friends. We’ve all known each other since our kids were in Kindergarten (they’re now going into 6th grade) and we routinely do mom’s nights out, but I decided it was high time we actually got away for a night. I rented a home in Truckee (near Lake Tahoe) and we piled into the biggest mom car (an Expedition) filled to the brim with snacks and yoga pants and wine. It was a weekend to remember, that’s for sure (or not…ha). I’ve never actually been out of town with women who were not bloggers, so it was a huge learning experience for me. All of the pictures we took were of each other…not food. When I took a picture of the drink menu at lunch and walked to a prettier table to get the perfect instagram shot, they thought it was funny. We went shopping at a local kitchen store and they got a kick out of how delighted I was by a mini scoop and a single white porcelain spoon. When we got to the house I’d rented, I’d wished I’d brought my camera and all the food so I could shoot all the things on the butcher block counter. And, believe it or not, when we made our dinner no one stood on their chair to capture the perfect photo of the sausage cheese dip. In fact, the only things that the group of gals on this trip had in common to the ones on the other trips I take is the same reaction they had when there was no wifi or cell service for 24 hours. The silence was nice but every once in awhile one mom would scream “I GOT ONE BAR!” and we’d all run for the deck and try to text our husbands and check Facebook. Of course, if I go on any trip, it’s going to be complete with food. 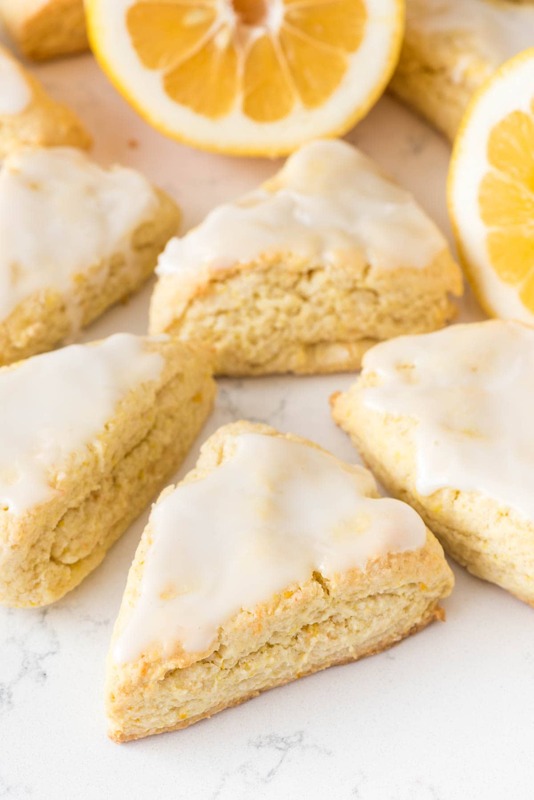 I brought oatmeal cookies and some not-yet-posted gooey bars, as well as blueberry muffins and these mini lemon scones. I gotta say, these scones are addicting. They’re breakfast AND dessert. I should know, I ate them for BOTH. So, you ask, what are the two secrets to this scone recipe? Well, first, the lemon flavor in the scone comes from instant pudding mix. Yes, you read that right. I added pudding mix to my scone recipe. Now, this shouldn’t be all too surprising, especially if you’ve ever had my Starbucks Copycat Petite Vanilla Scones. I added pudding mix to those scones too and they turn out perfect every time. Making scones is really simple, and I love adding the pudding mix because it keeps them soft. I’ve had some scones that are so dry they could be used as sandpaper, but I like a cakey soft scone, and this recipe produces that. They also stay soft for days because of the pudding mix. Picture it: I’m in my kitchen, making scones for a trip the next day. I have to get them made ASAP so I can photograph them before I lose my light. I mix up my flour/butter mixture, grab the egg, then reach for the heavy whipping cream…and realize I’m out. 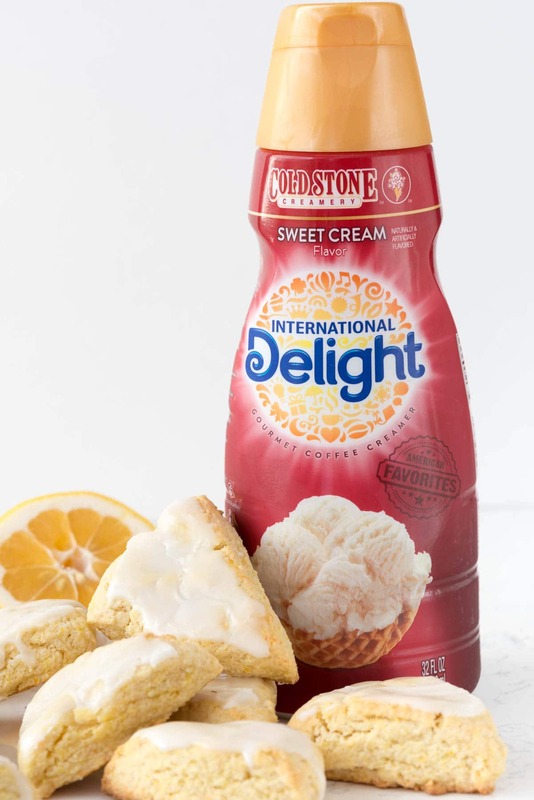 My International Delight Coffee Creamer. I figured, it’s got some fat in it, and it’s kind of like milk, so why not try? You guys, it worked. It worked fabulously – these were just as good as their vanilla cousins! International Delight saves the day…again. It’s not just to get you through your morning in your coffee…now you can add it to your scones. Also – think of the possibilities. 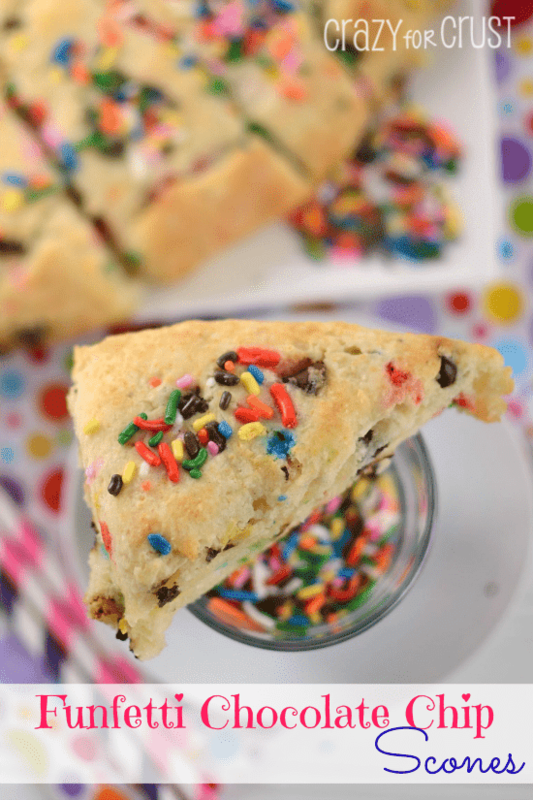 Use a pudding mix to flavor the scone – any pudding mix – and add your favorite flavor creamer. The flavor combinations are as endless as the amount of flavors of creamers and puddings. But, guys, start with lemon scones. They’re SO GOOD. No one instagrammed them on Sunday morning (I know, weird right? No one took pictures of breakfast?) but they made having no wifi even easier. These Mini Lemon Scones are full of lemon flavor with a secret ingredient: pudding mix! They stay soft for days and are the perfect scone recipe. Preheat oven to 425°F. Line a baking sheet with parchment paper or a silicone baking mat. Whisk flour, sugar, baking powder, and salt. Add diced cold butter and cut in with a pastry cutter until the butter is worked in and the mixture is crumbly. Stir in the pudding mix. Place the creamer, egg, vanilla, and lemon extract in a measuring cup. Whisk to combine. Create a well in the center of the dry ingredients and add the wet. Stir with a fork until just combined (there may still be some dry ingredients in the bottom of the bowl). Turn out the dough onto a cutting board. Knead the dough a few times until the mixture comes together and is smooth. Cut the dough in half. Form each half of the dough into a disk that’s about 1-2” thick. 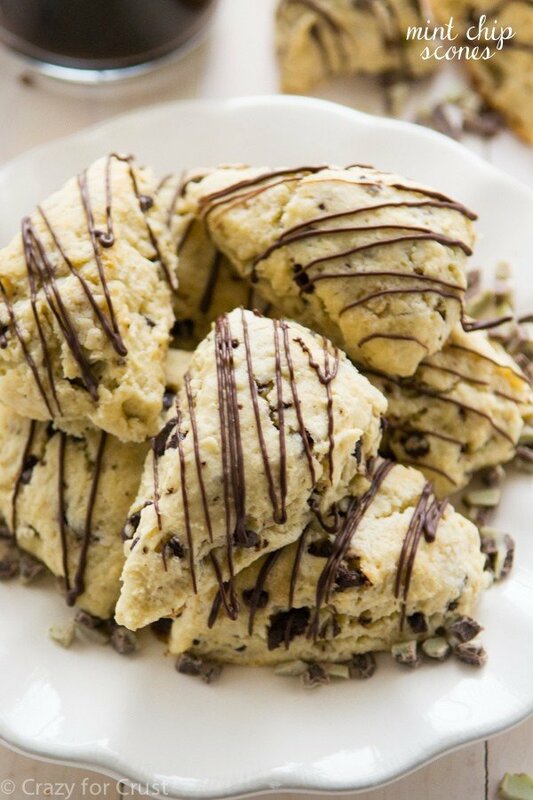 Slice each into 8 wedges, for a total of 16 mini scones. Place scones on prepared cookie sheet, 1-2” apart. Bake for 8-11 minutes, or until the bottoms are just golden brown. Cool completely before glazing. To make the glaze: whisk all ingredients in a small bowl. Drizzle over scones. Let set for a few minutes before serving or stacking. Thank you for the replay to the ?? re the lemon extract!!! I gave these a try back in January for my daughter’s baby shower. They were fantastic and so easy to make! Everyone raved about them! I am under orders to make these every time I visit my daughter. I’ve been here two weeks and I’ve made three batches! I read somewhere to freeze the butter and then grate it – what a time saver, and so easy to cut in! Loved making these scones!!! My husband and I have been hooked on scones since our recent trip to Ireland!!! I used a food processor for Step 2, but followed the recipe exactly after that. The dough was so easy to work with and cooking time with my oven was 9 minutes. The lemon glaze made with REAL lemon juice was fantastic!!!! After the scones were done, we had High Tea. Thank you for this recipe!! The Mini Lemon Scone recipe is EXCELLENT, but there are a couple of minor errors in the recipe. Nonetheless, it worked the first time I made it, and I’ve never made scones before. The recipe should say vanilla extract instead of lemon extract, and the amount of pudding is 4/3 ounces. I am going to be making a triple batch of these for a baby shower. Can I pre-make the dough and freeze it? Or should I bake them and freeze them? What are your thoughts?